NT Labs Marine Marinelab comprises four essential water tests for monitoring the long term health of a marine aquarium. 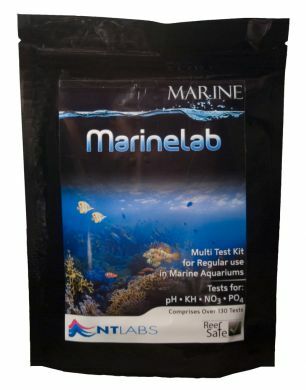 Together comprising over 130 tests for Acidity (pH), Alkalinity (KH), Nitrate (NO3), Phosphate (PO4) this multi test kit is a must have for every marine aquarium keeper to ensure optimum levels. Contains over 130 tests.